Social Media W isconsin's athletic program, with its high-profile coaches and student-athletes, unmatched fan base and media-friendly facilities, is a perfect match for the "Information Age." Now, more than ever, Badger athletics is on display around the world and is accessible via myriad forms of media, including television, the World Wide Web, social media networks, YouTube, Pinterest, mobile technology, newspapers and radio. Check out the Badgers social media page for all the options. 504,000 Fans and friends on Facebook, which ranks eighth for collegiate athletic programs in the country. 7 th UWBadgers.com ranks seventh nationally for page views 20 6 Sport-specific Twitter sites maintained for UW teams Sports have weekly inside UWBadgers.com Twitter Badger The most comprehensive and up-to-date method for following Wisconsin athletics is UWBadgers.com, the official website of the Wisconsin Division of Intercollegiate Athletics. First launched on Dec. 25, 1995, UWBadgers.com is one of the top collegiate athletic sites in the nation in page views. In December of 2012, the Badger site ranked seventh in page views and sixth in unique hosts among CBS online partners. The content is exclusively provided by the UW athletic communications and marketing staffs. 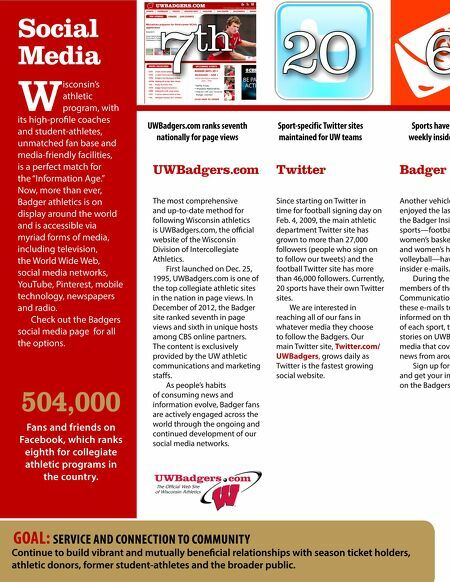 As people's habits of consuming news and information evolve, Badger fans are actively engaged across the world through the ongoing and continued development of our social media networks. Since starting on Twitter in time for football signing day on Feb. 4, 2009, the main athletic department Twitter site has grown to more than 27,000 followers (people who sign on to follow our tweets) and the football Twitter site has more than 46,000 followers. Currently, 20 sports have their own Twitter sites. 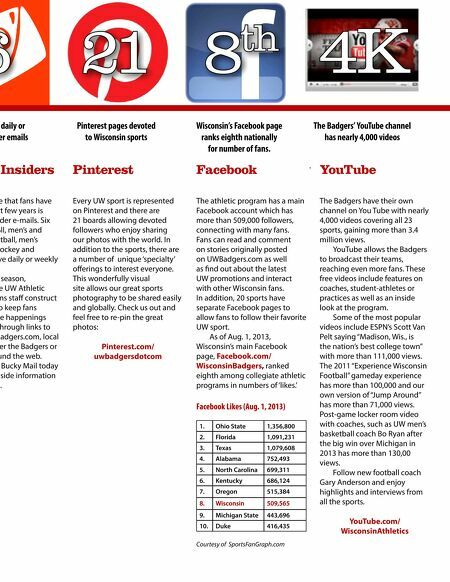 We are interested in reaching all of our fans in whatever media they choose to follow the Badgers. Our main Twitter site, Twitter.com/ UWBadgers, grows daily as Twitter is the fastest growing social website. Another vehicle enjoyed the las the Badger Insid sports—footba women's baske and women's ho volleyball—hav insider e-mails. During the members of the Communication these e-mails to informed on th of each sport, th stories on UWB media that cove news from arou Sign up for and get your in on the Badgers GOAL: SERVICE AND CONNECTION TO COMMUNITY Continue to build vibrant and mutually beneficial relationships with season ticket holders, athletic donors, former student-athletes and the broader public.